The Seven-Star shopping center in Rishon Letzion, located at 4 Lishansky Street, covers an area of about 13,000 square meters and includes two commercial floors, two offices floors and an indoor parking lot. 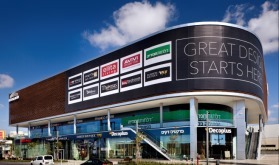 The shopping center consists of leading and contemporary brand name shops in the field of design and home decoration. The stores in the complex are: Luxury furniture ellita living, AVIVI Kitchens, Thomaslighting, Tzemer Carpets - Boutique, Hamadia Doors, Swiss Systems , Shwarts Home Collection, CALIA ITALIA– Italian furniture, Goldstein design culture, Ben Itai furniture - children´s furniture. In addition, there is a "Biga” café and restaurant, event hall - "SIETE" for concept events and a body-shaping studio for women from a large national chain – "Sher Fitness". ILDC owns 50% of the project.